This Ohio State flexible emblem by ProMark has an adhesive backing for placement on hard surfaces. 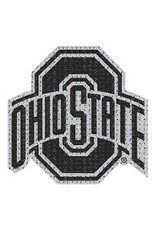 The emblem incorporates rhinestones and glitter to give an amazing bling look. Approximate 6.25in x 6.25in.